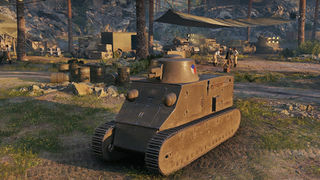 The Kolohousenka is a Czechoslovakian tier 1 light tank. The Kolohousenka leads to the LT vz. 35. 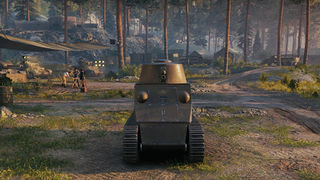 The Kolohousenka is without a doubt the most basic tank in the game. Everything about it is so simple. 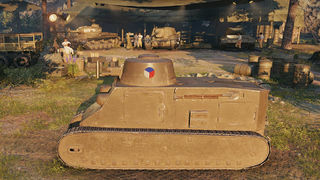 Because of this simplicity, it is very likely to attract new players to the game especially due to the lack of modules that need to be researched. Only the gun can be upgraded and is required to be researched in order to research the next tank, the LT vz. 35. As far as actual game-play, there is nothing fancy about this tank. While it has a relatively powerful gun for Tier I standards, it is quite slow. The 50 horsepower Hanomag WD-50PS is actually a tractor engine, not surprising since the entire tank is based on the WD-50 chassis. It does, however, have superb gun depression and can be played as a brawler if used in hilly terrain. Because the tank is very narrow, it can be more difficult to hit, especially with the poor accuracy of Tier I guns. Overall, the Kolohousenka is a great starter tank for new players in a game with a very steep learning curve. 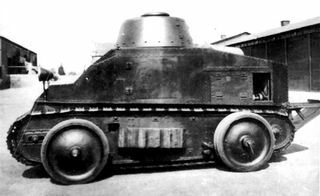 Vollmer subsequently moved to Czechoslovakia, to join the Škoda company for whom he designed a wheel/track light tank, the KH-50 (Kolo-Housenka). This design had roadwheels mounted on the drive sprockets and jockey wheels behind them to support the tracks. 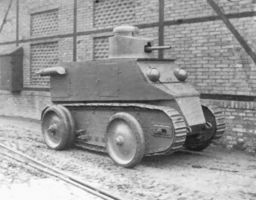 Despite impressive specifications for the period - 13 mm armour, 37 mm turret-mounted armament, and a 50 hp engine capable of driving the tank at 8 miles per hour (13 km/h) (on tracks) and 22 miles per hour (35 km/h) (on wheels) - it was rejected by the Czech army. The army was, however, impressed by the hybrid wheel/track concept and commissioned further studies, which resulted in the KH-60 (1928–29) and the KH-70 (1930). In these two designs the engine power was increased to 60 hp and 70 hp respectively and a better system was developed for switching between track and wheel use which allowed a change in less than 10 minutes. 2 KH-50 prototypes were built, one of which was later converted to a KH-60 and the other scrapped. Actual production included 2 KH-60s to the USSR and 1 KH-70 to Italy. The wheel-on-track concept was finally abandoned in 1934. * The wheels (Can be seen in historical image) attached to this tank is missing. It should be noted that they were capable of being removed completely, though. The historical speed of the Kolohousenka was at most 18 kilometers per hour for the KH-60 and KH-70, and only 15 kilometers per hour for the KH-50. The Kolohousenka as it appears in-game is a hybrid, combining the turret of the KH-70 with the hull of the KH-50. This page was last modified on 6 June 2017, at 09:34.